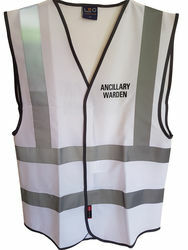 ​ Titles added of your choice to front & rear of Vests - See Examples below - Please enquire. Coloured Vests are not approved for day use in Australia. Only Orange and Yellow vests meet the Australian Standard for daytime use. Many of our customers require vests for visibility or identification, without actually needing to meet Australian Standards. For example a school uses the vests so the teacher on duty can be quickly visible in a bright pink vest. A VIP personnel protection agency uses black vests for their armed security guards. Using coloured vests is a great way to be visible and stand out.